Two special wines lit up my weekend, and stole the spotlight at an informal dinner with friends last night. 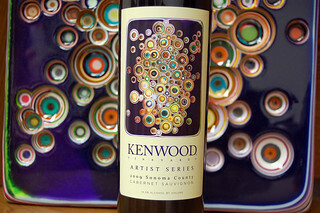 First up was the Kenwood 2009 Artist Series Cabernet Sauvignon, the 35th vintage of that remarkable run. “He pours, pools and brushes paintings with layers of opaque and translucent color, opening windows to the wood support beneath manifesting a complex interplay between fore and background. The decadent glossy finish of this work is truly eye-catching, but Linnenbrink’s skillful layering technique that forms deep and exquisitely chromatic concentric circles is the real draw.” Or the real drawing?!? Whether you know your art or not (count me in the not camp), the painting pictured, entitled ‘THESTATEYOU’REIN” does in fact put your head in a good place, and serves as a fine introduction and background to the wine. Principally Cabernet Sauvignon, with 7% split between Malbec and Petit Verdot (thankfully, no Merlot! ), it is head and shoulders above any comparably-priced California Cabs I’ve had recently. The wine is supple and complex, nicely-layered with mixed blue and purple fruits, a seam of licorice, the barest hints of fresh herb and moist earth, and the grip and length and balance to age gracefully for a decade or longer. If you can keep your hands off it. Personally, I’d drink it right now, as good as it’s tasting. You may find it here online – along with several back vintages of the same series – priced at $75. The second wine was opened with even higher expectations, and more than fulfilled them. It was a bottle of Lemelson Vineyards’ 2001 Reed & Reynolds (Resonance) Pinot Noir, sent directly from the winery’s cellar. As I’ve written many times in this blog, I am frequently opening older Oregon Pinots, and they are amazingly good. But this one was particularly special, as the vineyard, now named Resonance, was just acquired by Maison Louis Jadot. In fact, I was just at Trisaetum a couple of weeks ago, where the 2013 Resonance grapes were being processed, and winemaker Jacques Lardière, who had just retired from Jadot after a more than four decade career, was energetically engaged in hand-sorting the plush fruit. Lardière, one of the most likeable winemakers in the business, spoke eagerly about his enthusiasm for this new project, which will bring him to Oregon on a regular basis. As much as there is for him to learn about Willamette Valley viticulture, the education will certainly go two ways, and Trisaetum’s James Frey acknowledged that he felt as though he’d won the lottery when Jadot decided to make wine at his facility. Lemelson’s 2001 was exceptional in every way, and in perfect condition, with no signs of fatigue or any near-term cliff-jumping. It was rich and perfectly balanced, perhaps a little fruitier than a Burgundy, but with similar detail and complexity. Could it age another decade? I would not be at all surprised. I checked back to see if I’d reviewed this wine previously and apparently I had not, though Lemelson’s 2003 Resonance Vineyard Pinot earned 93 points. In fact, among 14 reviews of the vineyard designates, most from Sineann, all but two earned scores in the low to mid-90s. It’s fair to say that this is one outstanding vineyard, and now a proven producer of ageworthy wines also. There is more and more evidence, thanks to founding Oregon wineries such as The Eyrie Vineyards, Ponzi and Adelsheim, that the best of this state's Pinots continue to develop and improve in bottle over many years. That is the last piece of the Pinot puzzle, and it’s fitting comfortably into place. Hi, Paul. Two nice wines indeed. I'm curious: was your, "....thankfully, no Merlot..." simply a joke a-la Sideways, or something else? Brandon, my Merlot comment was a shorthand way of making the point that in California Bordeaux blends, even at the high end, Merlot rarely has anything to contribute. It's quite different in Washington, but in California, I think Malbec and PV bring a lot more to the party.